Concrete mixer is a necessary equipment for production of concrete, are widely used in engineering concrete mixing station and commercial concrete mixing station. 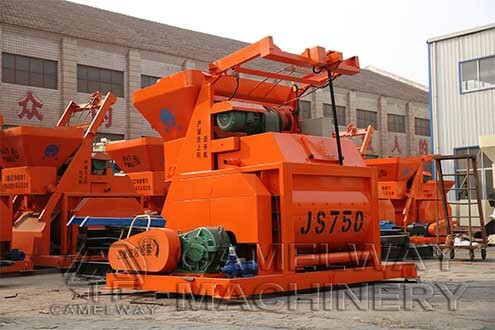 JS500, JS750 forced concrete mixer by users like, not only can be used alone, can also used with batching plant forming a simple concrete mixing station. Today, Zhengzhou CamelWay Machinery will tell you how to debug the forced concrete mixer. 1, regularly check the reducer and the smooth parts of concrete mixer to keep lubricating oil enough. 2, check the electrical wiring of motor and the components and all piping shall be properly placed. Supply voltage: extra voltage is 380 v, error of plus or minus 10%. 3, regular check mixer, two half shaft rotation direction should be together with the panels indicate direction, if the direction is wrong, should change the power supply wiring. 4, launch a discharging organization, the discharging door open and close should be accurate in place. Launch water pumps, water supply system should be the normal work; According to the concrete proportioning concluded that water supply, and regulate time relay to the corresponding water supply. To keep mixing motor work.